Harry Clifton has lived in places throughout Europe, Africa, and Asia, but his newest volume, Portobello Sonnets, focuses back on the district in Dublin where he currently lives, having returned after sixteen years in continental Europe. In this interview, he talks about how his work has evolved over time and place, and what ultimately brought him home. WFU Press: You have said that Portobello Sonnets is at once a celebration of place and a coming to terms with age. Can you explain what that means? Clifton: The presiding ghost behind Portobello Sonnets is the Irish poet Patrick Kavanagh, whose remarks about “smallness” I have used as an epigraph. Kavanagh concentrated on the local, the everyday, sidestepping the more heroic dimensions of poetry or being a poet. In his case, the dimensions are the pubs and betting shops of Baggot Street, not far from Portobello, which he believed to be the landscape of later age. His anti-aesthetic, “small as life, not large as life,” crept into these sonnets as they accumulated. He is also the healed, recovered figure in the final sonnet, based on a sighting of him outside the Rialto Hospital where he had been treated successfully for lung cancer in the summer of 1955. Having travelled so much and so broadly, what brought you back to Dublin, both artistically and in your personal life? What brought me back after sixteen years in continental Europe was the wish to reconnect with an older generation before it passed away. Unfinished emotional business, if you like. Artistically I lost the need to write big meditative poems of the kind I had tried in places, cities more conducive to the world-historical view of things. Smaller poems—cutting one’s cloth according to one’s measure. You’ve often used form to great effect in your work. What is your allegiance to form, and why did you choose the sonnet form for this collection? Form for me is like emotional mathematics—the need to resolve something inside that is chaotic before it does damage. I like Philip Larkin’s remark about ‘”the formal distancing of emotion,” the sense that you are not simply expressing yourself but making an object, preserving something alive inside a structure. Yeats’s “ancient salt is best packing” says the same thing. Open forms are fine with me, too, as long as they contain and intensify experience. Many of the sonnets grapple with a balance between connection and isolation; the poem’s subjects are often alone or lost in thought, even when they are surrounded by people or aware of others tangentially, through walls, windows, and mirrors. What draws you to this kind of juxtaposition? The landscape of alienation—Portobello, coming back to Ireland—becomes the landscape of loving reconcilement. I would like to think I fell back in love with myself and the place, though gradually, after the adjustments of return expressed in the opening sonnet. How do ideas of the local and the international, the parochial and the cosmopolitan, play out in Portobello Sonnets? Portobello, the area of Dublin I live in, is both local and cosmopolitan, a microcosm perhaps of what Ireland is becoming. Ethnicity, intermarriage, the human richness of the place itself—I hoped some of that texture would become apparent in the sequence, as well as my own crises and resolutions of the time. How did you determine the order of the sonnets? The first sonnets came to me in late autumn 2004 after coming back, and kept adding to themselves over the following winter, spring, and summer, at which point they stopped coming. I cut out the more violently negative ones and added a few a little later that had less to do with the narrative and more with a sense of place. So the sequence is, by and large, a natural chronology that came of itself. It is in essence a single long poem that I retitled “Portobello Sonnets” so it could be entered anywhere rather than read only from the beginning. Secular Eden: Paris Notebooks 1994–2004 was in many ways a summary of your work and met with great success. How do you think the volumes you have written since then are influenced by and/or respond to the themes of Secular Eden? When I came home from Paris, which is the matrix of Secular Eden and where I had lived from 1994 to 2004, I had the feeling I was stepping out of my own myth to become something or someone else. The myth of me to that point, insofar as there was one, was of the Irish poet speaking from exile, from the world in general. Arriving in Portobello that autumn of 2004 was like rebuilding an identity from the ground up. The sonnets chronicle some of the fears and vulnerabilities involved. I was also at work on poems that became The Winter Sleep of Captain Lemass, published in 2012, and a deliberate immersion in all things Irish, as Secular Eden is an immersion in the wider world. Can you describe the arc of your career from the early poems to the most recent? Why did you call your selected poems, published in 2014, The Holding Centre? About the only straight line in my life or lives (from an Irish perspective) has been the dedication to poetry, which has been my “holding centre” against the wayward and the centrifugal for over forty years. I was also thinking of “the centre cannot hold” in Yeats’s “The Second Coming,” and there is a poem in the Selected, about art and history, set in an actual holding centre. How has the place of poetry in Ireland, where it is more mainstream than in the US, changed in recent years? Poetry everywhere has professionalized and enhanced itself technologically—doubtless it will survive its newest modes of transference and the aggressive self-marketings of poets with websites. In the meantime, Ireland and America have grown pretty much identical in that sense. Lastly, what is your relationship to poetry being written in the US in all its variety? Which American poets do you feel closest to and why? American poetry liberated me hugely from the traditionalism and self-absorption of Irish poetry when I first went to university in Dublin. I still remember Stevens’s “Sunday Morning” being read at the introduction to poetry lecture and becoming aware that the sun now rose in the west, and the excitement of American poetry—it may be less so now—has never left me, the spectrum of open and closed forms, sometimes within the lifework of a single poet. Lowell, Stevens, Bishop, Roethke, Crane and Tate, early Ginsberg, Frank O’Hara. I still feel it was the mix of European philosophy and American poetry, those two excitements plus my own mad life, that were the making of me. Harry Clifton was born in Dublin, and has lived in places throughout Europe, Africa, and Asia. Internationally renowned for his poetry, he has published four collections with Wake Forest University Press: Portobello Sonnets (2016), The Holding Centre: Selected Poems 1974–2004 (2014), The Winter Sleep of Captain Lemass (2012), and Secular Eden: Paris Notebooks 1994–2004 (2007), for which he won the Irish Times Poetry Now Award. He also wrote On the Spine of Italy: A Year in the Abruzzi, a prose work based on a year he spent in Italy’s Abruzzi Mountains, and a book of stories, Berkeley’s Telephone and Other Fictions. 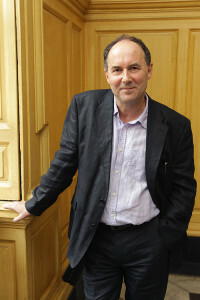 He served as the fifth Ireland Professor of Poetry from 2010–2013, and is a member of Aosdána, the Irish artists’ association. His newest volume, Portobello Sonnets, was released on November 1st.